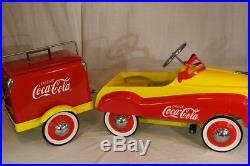 Coca-Cola Child’s Pedal Car w/ Matching Trailer and cooler. 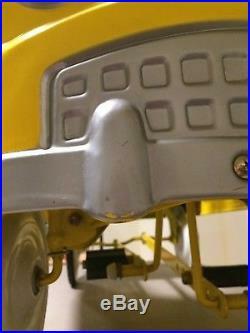 Gearbox Pedal Car Company. Full stamped-metal panels and frame. 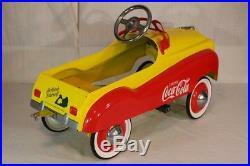 Total includes a pedal car, small trailer attached to the back of the car, and a cooler sitting on the trailer. 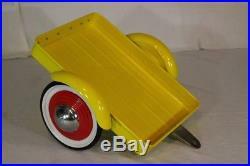 The car and trailer are painted in yellow and red. 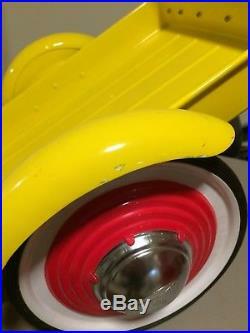 Chrome hub caps stamped with “gearbox”. White “drink coca cola” logos on all three pieces. 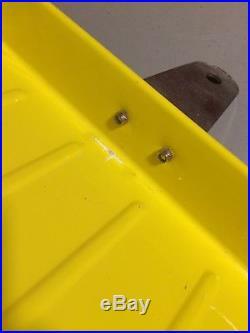 Trailed detaches from car with a pin. 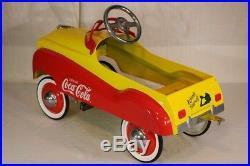 Original 2001 pedal car from gearbox. 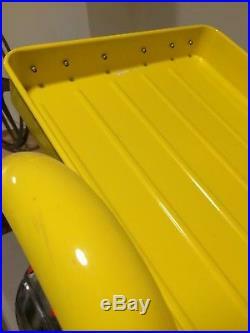 Excellent paint color, no fading, no rust, no dents, nice rubber on the wheels/ not cracked or dried, very nice all around. 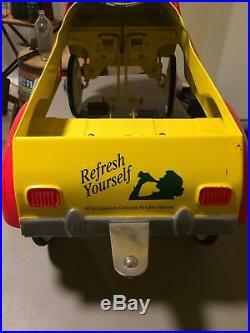 NOTE: there are minor scuffs/ scratches to the raised portion (gray) of the front and rear bumper allowing some of the yellow to show through, there is a scuff mark on the top-right portion of the back of the car where the “refresh yourself” logo is, and there is a small rub mark on the trailer’s fender. 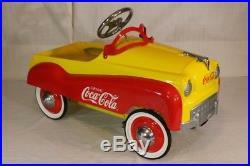 The item “Retro Vintage Coca Cola Pedal Car With Trailer And Cooler By Gearbox. 2001″ is in sale since Friday, October 5, 2018. 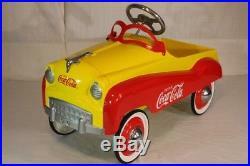 This item is in the category “Collectibles\Advertising\Soda\Coca-Cola\Trucks & Cars”. 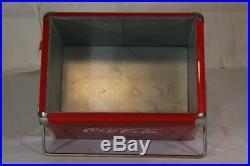 The seller is “zapin-57″ and is located in Candia, New Hampshire. This item can be shipped to United States.